All my fellow bloggers are going nuts about this necklace. And rightfully so, I must add. 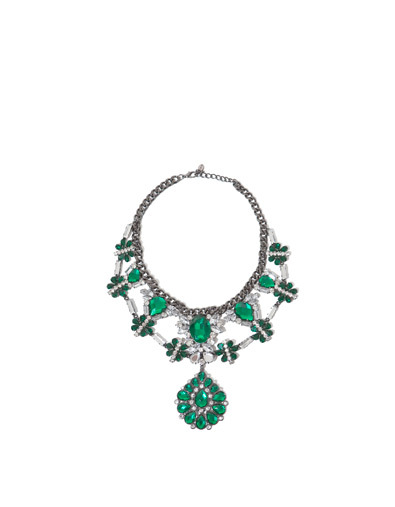 It is the perfect statement necklace in the most perfect color. As usual, I'd pair it with a white shirt/top/t-shirt for a cool, classic look that will let this piece shine. As bloggers andam todas loucas com este colar. E com muita razão. É o statement necklace perfeito, na cor perfeita. Como já é habitual, usá-lo-ia com uma camisa/top/t-shirt branca para um look cool e clássico que deixasse esta peça brilhar. p.s.- I was supposed to post this yesterday, but we decided to go to the movies and had to rush, so there was no time. Later today, I'll post today's countdown. p.s.- Era suposto ter postado isto ontem, mas decidimos ir ao cinemas e tive de me apressar e já não tive tempo. Mais logo, há a contagem decrescente de hoje. Really beautiful. I can always count on you to bring up some beautiful pieces to try and get. Something fit for a queen I might add.